Hello! I think it's been some time since I wrote a Sunday random post. I guess today is a good day to ramble again. I've been doing a lot of knitting lately. I'm working on a pair of socks, well one sock so far anyway. It's going okay, but it takes so long. I'm trying out some new audiobooks while I'm squinting at tiny stitches. I gave the audio version of The Wander Society a listen, but it's not working for me. From what I understand now it's a very visual book and it doesn't work well in this format. At least not for me. I am looking forward to Agnostic by Lesley Hazleton. I hope I have better luck there. I have been listening to a bunch of podcasts too. I'm enjoying The Sporkful and Judge John Hodgeman. 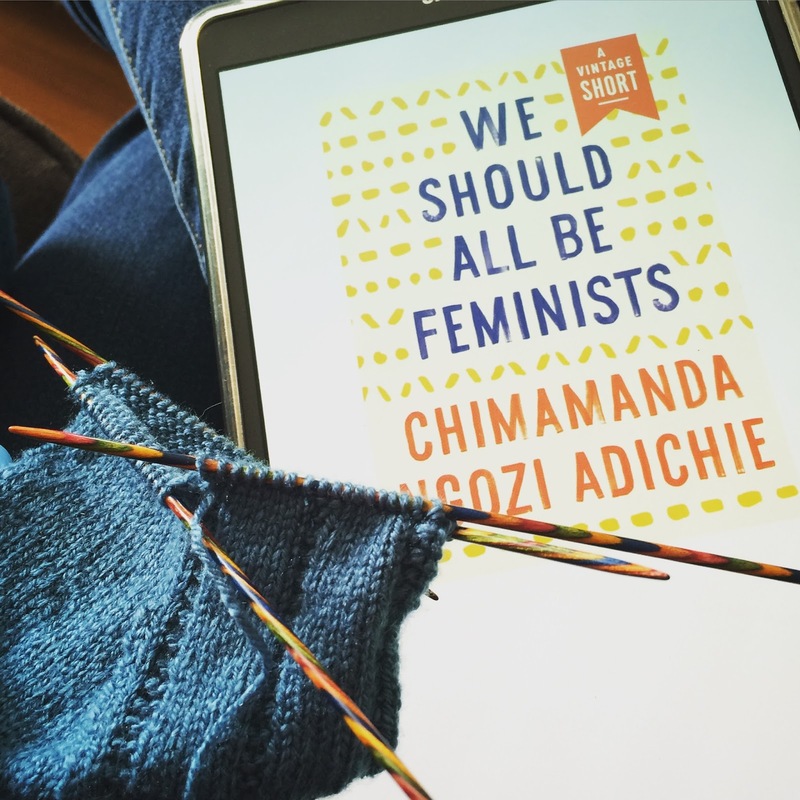 I read We Should All Be Feminists yesterday. It's so good. I just wish it were longer. Speaking of feminists, have you read Doing Decimal's post Do Female Bloggers Have an Obligation to Promote Feminism? I read it but didn't comment because I'm not sure I'd have anything important to add to the comments and I'm still trying to work out my thoughts about it. Obligation is a strong word, and I don't think anyone should feel obligated to promote anything when blogging. I know I tend to read more books by women, but maybe that's because I like female authors. I won't not read or review a book because a man wrote it if it's a book I want to read. I am trying to be a more worldly reader. For every American book I read (because that country dominated my reading last year), I'm reading a book from an author from somewhere else in the world. So far I've read books from authors in India, Korea, Japan, Italy, Sweden, Nigeria, Britain, Australia, and Canada. In other news, I'm looking forward to new TV! Outlander season 2 starts here tonight. Orphan Black's new shows start this week and The Unbreakable Kimmy Schmidt second season will be available on Netflix on Friday. Yay! That's all the randomness I have in me today. What about you? What is one random thought you want to share this Sunday? I agree that no one should be obligated to promote anything on their blog...it should be a choice. And I really need to read We Should All Be Feminists. My random thought is that I've been chopping wrong my entire life! I started a knife skills class today and I've learned a lot so far. I love learning about new podcast. I listen to them while wondering around my living room at night trying to get my 10000 steps for the day. So thank you for sharing them with us. I am ready for the shows I watch to start winding down since my DVR is so full. Also... I recently tried to crochet. Holy smokes that is hard to learn so I have no idea if I could ever knit. Good for you! Kimmy, is a great show, isn't it? I wish We Should All Be Feminists was longer, too! I think I am going to put We Should All Be Feminists on my readathon list and finally knock it out. I am so ashamed it has taken me this long to get to it. Obligation IS a strong word. We can be feminists but still read male authors or like male main characters. In fact, to avoid them would be its own form of discrimination, wouldn't it?